Fiction – paperback; Pushkin Vertigo; 128 pages; 2016. Translated from the French by David Bellos. 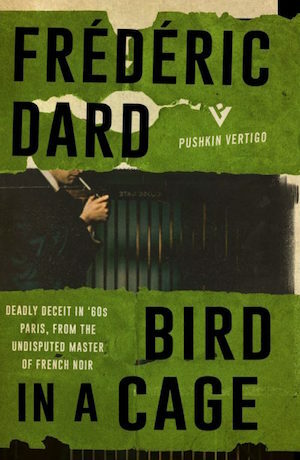 Crime novellas don’t get more slick and out-and-out gripping than Frédéric Dard’s Bird in a Cage. First published in 1961, this cleverly plotted tale has recently been reissued in English translation by Pushkin Press’s Vertigo imprint, which has two more of Dard’s novellas — The Wicked Go to Hell and Crush — on its list and a third one, The Executioner Weeps, on the way. Apparently he was quite the prolific writer, having penned hundreds of thrillers, suspense stories, plays and screenplays during his career, before his death in 2000. Bird in a Cage is one of those brilliant crime books that is full of so many dark and twisty turns and unexpected revelations that you begin to question your own sanity. The further I got drawn into this thrilling tale, the more my questioning mind went into overdrive. Did I miss a clue? Where *is* this story going? What’s going to happen next? Who do I trust here? This isn’t going to end well, is it? Someone’s going to slip up here, aren’t they? And so on, and so forth. The story revolves around a 30-year-old man returning to his childhood home in Paris after a long absence. It’s Christmas Eve, a time when everyone is supposed to be enjoying themselves with family and friends, but Albert’s mother has died and he feels her loss keenly. To distract himself, he heads out to a local brasserie for a quiet meal, and while there he catches the eye of a beautiful young woman eating out with her daughter. An unspoken connection is made and he follows her home — more by accident than design. The woman is aware she’s being followed and issues an unexpected invitation: would he like to come up to her apartment for a Christmas drink? Albert’s decision, of course, is a fatalistic one — but not in the way you might expect. The curious mystery that unfolds has Albert wondering if he might, in fact, be delusional, which is exactly the same kind of “trick” the author plays on his readers. For with each turn of the page you find yourself wondering what *exactly* is going on. Can you trust the narrator? Can you trust the beautiful woman? Why does she have two drops of blood on her sleeve? And why is she so keen to befriend a man when she’s a married woman? Of course, I’m not going to spoil the plot here, but let’s just say I was kept guessing throughout and I would never in a million Sundays have solved the crime in question. The ending, when it comes, is genius. There’s a dark, brooding atmosphere to the story, which makes it thrilling to read. And the prose, eloquent and stripped back to the bare minimum, ensures minimal effort is required…yet it is not without important detail and it is those little details — two lonely people adrift in a Parisian Christmas — that give this book its special appeal. But above all, A Bird in a Cage is a masterpiece of plotting and of narrative pacing and is so packed with suspense it’s a wonder the pages don’t explode out of their binding as soon as you open the book. This is definitely a must-read for those who like their crime on the tense and intelligent side. This was my first Frédéric Dard; it won’t be my last. This sounds great – the Pushkin Vertigos are such a great range – and I’ve seen it compared with non-Maigret Simenon, which has to be good! I’ve never read Simenon, but am tempted now. Also want to read more Dard. That’s the dangerous thing about reading: one book leads to a million more! This sounds like a compulsive read! I really must try one of these Vertigo titles, they sound uniformly great. Yes, if this is any indication of Vertigo’s quality then I must read some more! You should definitely review a (non-Maigret) Simenon, then I’ll know whether to try Dard. I used to be a big Simenon fan, but gradually grew away from psychological novels as I got older. I will investigate further. I thought I had a Simenon in my pile, but fear I may have donated it to charity during one of my many book culls — the unfortunate downside of living in small London flat. I read “The Wicked Go to Hell” and as short as it was, I thought it really carried quite a wallop. When I read that book, I was surprised that the writer had written so many books but we never heard of him until now. Kudos to Pushkin for getting his books out there. Great review! Thanks Marjorie. Good to hear that The Wicked Go to Hell made an impression on you… I really want to read all the ones Pushkin have published now and this sounds like a good place to start. I’ve got this earmarked for the Pushkin Press focus fortnight in Feb with @stujallen … the premise alone is so compelling and now your review means I’ll make sure I start it when I’ve time to read it in one go as can’t imagine being able to put it down! Didn’t know about Stu’s Pushkin Press fortnight… yes, this would fit the bill nicely. It’s a really gripping read and so cleverly plotted.